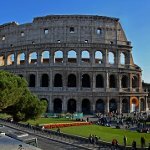 Rome Foundation Day is a semi-official holiday celebrated in the Italian capital on April 21 or the closest weekend. The celebration includes a costumed procession and a symbolic opening of the city gates. According to legend, Rome was founded by Romulus and Remus, the twins who were suckled by a she-wolf. Their mother was the daughter of Numitor, the former king of Alba Longa. Numitor was ousted by his brother Amulius, who killed Numitor’s son and forced Rhea Silvia to become a Vestal Virgin in order to ensure that Numitor had no heirs. However, Rhea Silvia conceived from the god Mars and gave birth to twins. Amulius ordered a servant to kill the children, but the servant set them adrift on the river Tiber instead. The twins were washed ashore and suckled by a she-wolf who had lost her own cubs. Eventually, they were adopted by a shepherd. When Romulus and Remus grew up, they returned to Alba Longa, learned of their past and killed Amulius. Numitor was reinstated as the king, and the twins set out to found a city of their own at the site where they had been found as infants. The brothers disagreed about the hill upon which to build, and Remus was killed by Romulus in a bout of anger. Romulus went on to found Rome on April 21, the day of the festival sacred to Pales, a goddess of shepherds, flocks and livestock.